Temperamental gelatinous sponge Donald Trump has finally, after months of writer’s block, come up with the nickname “1 for 38 Kasich” for GOP rival John Kasich. Sad that he couldn’t think of anything better! 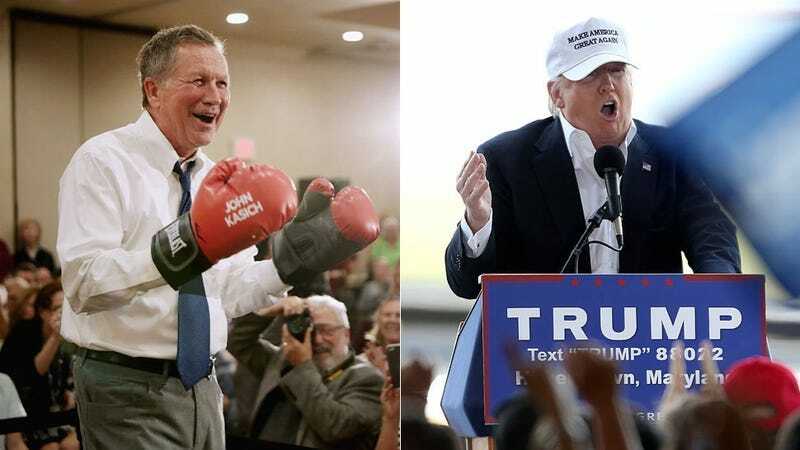 It’s not clear how Trump arrived at his denominator, but the numerator is right: Kasich’s sole primary victory came in his home state of Ohio on March 15, and he remains behind Marco Rubio in the delegate race even though the Florida senator left the race more than a month ago. It appears that Trump has broken the cardinal rules of name-calling, which are 1) pick a catchy nickname that 2) is not regularly subject to change.